My 1st Competitive Team in YEARS! 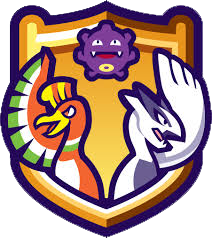 [SMOGON] My 1st Competitive Team in YEARS! So ummm, Hi everyone. Its been over 2 years since I've been on these forums and over 2 years since I played Pokemon competitively. I recently started playing again on Pokemon Showdown and I've been having fun with it. It's a little hard knocking the rust off, but still fun lol. So let me start out by saying that even though this community was always more VGC focused, I always played singles. Why? Because I sucked at VGC lol. And I always loved the lower tiers in Smogon because of the variety of different pokemon that were viable. So this will be a write up of an NU Hazard Stacking Team that I've been using recently and that I've had some success with. So, without further ado, lets get into the team building process. So when I was first getting back into things, the first thing I noticed was there were multiple Mega Pokemon in NU now. Last time I played it was only Mega Audino in the tier. So I immediately wanted to use a Mega on the team and build around that. And the Mega I chose? Mega Glalie! I knew I wanted to use Mega Glalie right away, but at this time in the process I didn't know the type of team I wanted to build around it. So I kind of pieced it together as I went along and added more members to the squad. So let me start out by saying this, and this might be a hot take, but Heliolisk is the best pokemon in the tier. Period. Its an incredible wall breaker on the special side of things and is a perfect compliment to Mega Glalie. It eliminates bulky Water types that Mega Glalie can't deal with and in turn, Mega Glalie can eliminate most ground types that check Heliolisk (barring Steelix). Volt Switch is great for momentum and getting favorable matchups for Glalie and other members we will discuss later. Hyper Voice and T-Bolt are powerful STAB attacks that allow Heliolisk to punch through anything and everything. Surf is there to beat ground types like the aforementioned Steelix which Glalie struggles with. The amount of pressure these 2 pokemon put on opponents force a lot of switches, which is where the wheels started spinning in my head to try to turn this into a hazard stacking team. So for that, I needed more of them. So, you might be asking, "what makes Druddigon unique?" Well the answer is it's the only pokemon in the tier with access to Mold Breaker and Stealth Rock. That means its the only pokemon in the tier that can set up hazards freely on Xatu, the biggest nemesis of hazards in NU, because Mold Breaker bypasses Magic Bounce. I put a Rocky Helmet on it for some chip against pokemon the team struggles against, such as the mighty Incineroar. Dragon Tail is great for phasing pokemon out to prevent set ups and also to rack up hazard damage on the opponents pokemon. EQ is coverage to hit Steel types. Glare is nice for crippling opponents pokemon. "Wait, I thought you said earlier there were a lot of bulky Water types in the tier. Why is Blastoise unique?" Well, that is true. There are an abundance of bulky water types in NU. Vaporeon, AV Clawitzer and Slowking, Jellicent, Unaware Quagsire... the list goes on and on. What makes Blastoise unique from all the others is its access to Rapid Spin. Scald is a must on any bulky Water type because of the 30% burn chance. Toxic is here to cripple opposing walls such as all the Water types I just listed. Ice Beam is there for coverage against Grass types really. So, at this point I have 2 of the strongest wall breakers in the tier on the team. Hazards that can be stacked freely. And 2 walls that can wear down opposing pokemon by inflicting status, Rocky Helmet chip damage, and phasing out opponents into unfavorable match-ups which forces more switches and extra damage from hazards... But I had nothing to take advantage of that at this point. So the last 2 spots on my team went to pokemon who could take advantage. Now I will be completely honest, when I first added Decidueye, the reason for it was "Oh, Decidueye seems cool and I never used it before (It was RU last I played years ago), lets try it!" I didnt realize how well it fit with the rest of the team. First off, Grass typing. There were still some bulky Water pokemon (yes, they really are so abundant in the tier I am mentioning them AGAIN) that I couldn't deal with easily. Seismitoad, Volt Absorb Lanturn, Gastrodon, and Quagsire to name a few. So having Leaf Blade was huge. As I mentioned in the brief intro to this pokemon, I needed set up and priority on the team, which is why Swords Dance and Shadow Sneak are on the set. Spirit Shackle is nice for trapping in walls allowing Heliolisk and Glalie to come in relatively safe in certain situations, plus with Decidium Z, Sinister Arrow Raid is able to punch holes and eliminate certain checks to Decidueye like Vileplume, Druddigon, and Golbat. BUT on top of all that, Decidueye being part Ghost type makes it a spin blocker, preventing opponents from Spinning away the hazards I stack, which is the extra value I didnt notice immediately. Like I said, I knew right away that Delphox needed to be the final member of the team. However, this was originally a Calm Mind set with Colbur Berry because I was worried about the lack of special bulk on the team. After a couple battles I realized how much I struggled to beat opposing Choice Scarfed Pokemon so I made the switch to a Scarfed set because with base 104 Speed, Delphox will out speed a lot of the common Choice Scarf users. Fire Blast and Psychic are the main STAB attacks for Delphox. Grass Knot is to hit, say it with me, "All the bulky Water types in NU" super effectively. Dazzling Gleam is to hit Dark types that like to switch in and is able to OHKO Pokemon like Dragon Dance variants of Scrafty and SD Pangoro who would try to use Delphox as set up fodder. It is also Delphox's only way of not being completely walled by AV Incineroar. Another thing about adding these 2 Pokemon to the team is they both resist the main weakness of the Core of this team, Fighting types. I love this team. The synergy that each Pokemon has with each other works really well. Whether its the Hazards set by Druddigon and Glalie weakening Pokemon for Decidueye and Delphox to sweep easier late game, Delphox and Glalie eliminating Grass types that check Decidueye and Heliolisk while the ladder 2 return the favor by eliminating Water types that check Glalie and Delphox, Druddigon and Decidueye manipulating match-ups by phasing/trapping Pokemon. It all gels very well together... but it isn't perfect. There are a few things that stood out to me as problems for this team to deal with. Incineroar - Arguably the most used Pokemon in NU, Assault Vest Incineroar is a problem for this team. None of my offensive Pokemon deal with it very well. The way I have beaten Incineroar with this team is weakening it with Rocky Helmet chip and Hazards to the point where its in range of the other Pokemon to clean it up. Defog - I have a way to stop Rapid Spinners from removing my hazards, but nothing to stop Defog. No Defiant users like Passimian or Braviary to punish a team for Defogging away my hazards. Toxic Spikes - Toxic Spikes are the one hazard this team doesn't appreciate. Blastoise can spin them away, but having one of my main walls crippled with Toxic is annoying. A Poison type to absorb Toxic Spikes when entering the field would be beneficial. Knock Off - This is a problem for 2 reasons. First reason is I simply don't have it on the team. Second reason is I have no Dark type resist on the team so there is nothing to stop my opponents from spamming it. Fairy Types - I Don't have any way to hit Fairy types Super Effectively. Just relying on chip damage and wall breaking to deal with them. Luckily, there aren't many Fairy types in the tier. Mega Audino, Whimsicott, and Comfey are the only 3 you will see regularly on the ladder and Delphox walls 2 of them. Below I will put some battles for everyone to watch of me using this team. Joeypoppems is my Username. Woh, this is awesome @Bucsfan818! I'm going to try it out right now! thanks for sharing. Hope you make another write up soon! (Apr 16, 2019, 12:31 PM)PokemonRules Wrote: Woh, this is awesome @Bucsfan818! I'm going to try it out right now! thanks for sharing. Hope you make another write up soon!